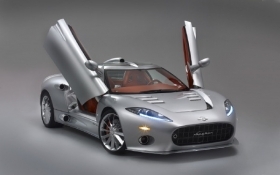 Spyker will build its C8 in Coventry, England. MUNICH -- Spyker Cars plans to relocate its vehicle assembly operations to England from the Netherlands to cut costs. The Dutch luxury sports car maker said it will relocate production to its supplier, CPP Manufacturing Ltd. in Coventry, central England, from Zeewolde in the Netherlands by the end of this year. "With approximately half of our vehicles' parts and components sourced in the UK, and virtually all key suppliers being located there, moving closer to our suppliers and engineering partners will result in substantial savings," Spyker Cars CEO Victor Muller said in a statement. About 45 of Spyker's 135 employees in the Netherlands will lose their jobs. Engineering, sales, marketing and the Spyker Squadron race team will remain in Zeewolde. Originally founded in 1875 as a coachbuilder, Spyker built its first car in 1898. The company later diversified its production and built fighter aircraft and aircraft engines. Spyker built 21 cars in the first half. The company lost 8.7 million euros in the first six months and its sales fell by 1.6 million euros to 4.1 billion euros compared with the year before.